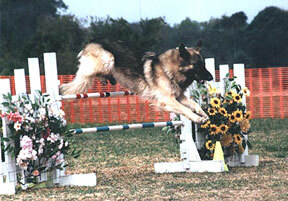 Agility competitions are one of the most popular dog sports available to our athletic breed. This enjoyable activity consists of a variety of canine obstacle courses. Shiloh Shepherds may earn titles under the provisions of the United States Dog Agility Association, North American Dog Agility Council and the United Kennel Club. A well balanced Shiloh Shepherd can perform this type of activity with ease and speed as an adult. However, due to slower bone growth in our "gentle giant" puppies - always be sure your dog is fully matured before introducing any jumping sessions or strenuous obstacles. During Agility, dogs are required to negotiate assorted types of equipment such as the dog walk (an elevated balance beam), weave poles, a teeter-totter, an A-Frame (climbing wall), tunnels, as well as circular and standing jumps of various designs. Handlers run beside their dogs, calling out commands and providing directions by giving hand signals to guide them from start to finish. The team that navigates the course in the fastest time with the least amount of faults receives the best scores.